In his recent mini-documentary "Is the Sky Pink?," filmmaker Josh Fox touches on one of the key reasons why government is so often stymied in its efforts to protect public health. So long as there is a "debate" over something, regulation and legislation can be postponed until the science becomes "clear." And so long as there are scientists and academic institutions ready to abandon ethics when money comes along, "debates" can be manufactured to suit the circumstances, and efforts to protect public health can be delayed indefinitely. A recent article in Bloomberg News illustrates how oil and gas companies engaged in fracking have paid research scientists and even state universities to literally create science that supports fracking. The practice gives new meaning to the term "creationism." 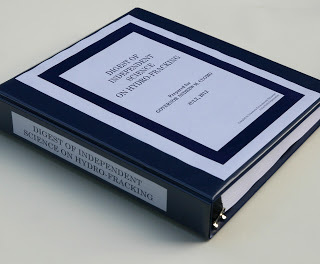 Last week, Grassroots compiled and delivered to NY Governor Cuomo a Digest of Independent Science on Fracking. By "independent," we mean just that - studies and reports that were conducted by scientists for whom the word integrity still has meaning, and who respect the role of honest science in helping to inform - rather than obfuscate - the public discourse. We salute their work, and sincerely hope that the Governor will take the time to read through the Digest we delivered to him. If he does, he'll know exactly what to do about fracking in New York.